BOP ON TREND: Two words. High-waist and layers. Okay, three if you count waist. Heading to the movies in this get-up? You're kidding me. Enter the cropped sweater. 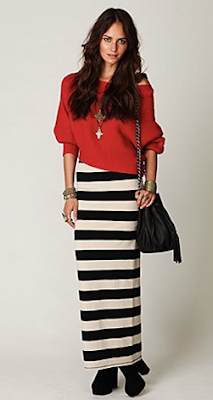 Some of the same pieces can be applied to the cropped sweater as the cropped top. I've found that if you stick to high-waists and layers, the cropped top or sweater can be pulled off seemlessly. 1. High waist, high waist, high waist. No matter what you pair your crop top with, the secret to pulling it off is high waisted pants, skirts, shorts, etc. Whatever it is, make sure it's high waisted so you're not mistaken for any of the "when it's acceptable to belly-bare" (see first paragraph) situations. Play with some dresses and bum-skimming shirts you may already have. It will automatically create a whole new look to a dress as well as add a unique flare to a tradional skinny jean and top outfit. Cropped and off the shoulder, how 'bout it?